President Coltrane is never going to be able to leave this behind until he releases the documents. The $10K a head President’s Review Panel meets again next week with a brief public session, and no evidence whatsoever that they are willing to ask hard questions. 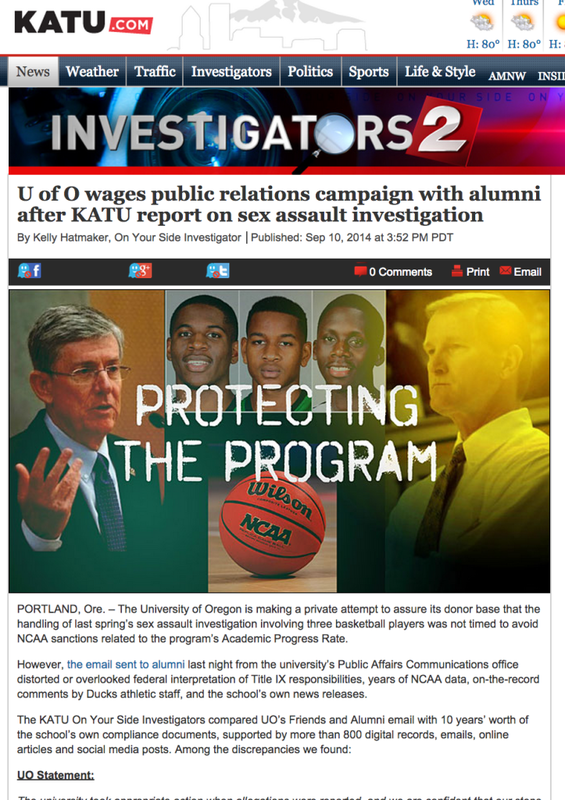 The letter to alumni claimed that the KATU story “misrepresented” the “expertise of a retired U of O faculty member”. I am the faculty member in question. Obviously this is an ad hominem attack, as one voice on this blog has noted, and a serious one–rather like the U of O administration’s previous disparaging Jennifer Freyd’s integrity as a psychologist. The email did not say how my “expertise” was “misrepresented” by KATU. I wrote the U of O news office, the source of the email, immediately asking for an explanation. They have not responded. KATU contacted me about this and I asked that they not comment until such clarification was received. I gather the email’s stressing I was “retired” meant to suggest I was a dithering old fool, given to crack-pot pronouncements. For the record: I am an emeritus professor who took early retirement when I was invited to Oxford University. I studied at Harvard Law, as well as having a PhD in philosophy. I taught for many years in the philosophy department, then switched to the conflict resolution program in the law school. As of this fall I no longer teach courses, but I continue to direct a program that takes U of O students to Oxford to study human rights. Get in touch with me if you are interested in the program; you can do so through the law school website. Were you not prepped properly for this position at all? You are running out of time to dump all this ugliness on Gottfredson and give yourself a clean slate. Take a stand, will you? You were among those frustrated by Gottfredson’s early action/inaction and what have you done differently? Do something already!! How many UO presidents can be destroyed by one athletics scandal? How many university faculties can be destroyed by presidents bowing to their athletics departments? My dream is that Scott and Chuck tell the University that the rogue unit responsible for slandering Cheyney and Jennifer has been properly dealt with. Then they lead a search committee that chooses a President who we would also be proud to have serve as faculty, in case the presidency didn’t work out. Did anyone else notice the bit about how the academic side is paying for 75 tutors working 20-25 hours a week, solely for mentoring athletes? Sounds great, now let’s make sure that every struggling student has an opportunity to get some help. The (non-athletic) Academic Advising office is so underfunded and overwhelmed, that they won’t even speak with students unless they are undeclared. What would it take to make sure that we can compete at the highest academic level? I have some serious concerns surrounding the whole basketball sexual assault incident, but the way this blog handles something like the KATU story demonstrates why the blog is so problematic for the university. The KATU story has been widely denounced as sensationalist journalism driven by the efforts of a right-wing TV station to attract attention and money (see the many thoughtful comments to the Oregonian story at http://www.oregonlive.com/ducks/index.ssf/2014/09/university_of_oregon_responds_1.html). But UOMatters is so anxious to draw attention to anything and everything that sheds a negative light on the university that he makes no effort to bring the same kind of critical perspective to negative stories that he routinely brings to stories casting the university in a positive light. As a result, alums who read the blog become increasingly disaffected (see the post the other day from the UO Alum who just assumes everything is terrible), prospective female undergraduate students are choosing to go elsewhere, and on and on. There’s lots of things that could be improved here, but the failure to bring any kind of critical perspective to negative as well as positive things is discouraging, to put it mildly. Thanks for this thoughtful comment, and please keep them coming. Perhaps I am too focused on serving as the counterbalance to the PR fluff and party-line tripe coming out of around the O and the strategic communications office? Thoughtful comments from the Oregonian story online? Seriously?? What a joke. The Olive blogs, especially sports related, are a cesspool of moronic babbling and what liberals usually like to call hate speech–at least when it’s not about their long cherished ideals. Your “right wing” comment just insures that you too, while dramatically appealing to “bring critical perspective” are incredibly biased. http://seattletimes.com/html/businesstechnology/2020756844_fishersinclairxml.html). To refer to Sinclair as right wing is no more an indication of lack of critical judgement than it would be to call the Guardian left wing. You are swerving around the point, anon. What about this KATU article do you find in error? Or is it only that Sinclair Broadcasting is involved, and you can use this in an anonymous PR troll campaign to link UOM with groups that supposedly “lack critical judgement?